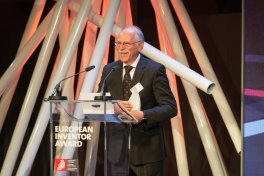 The EPO presented the European Inventor Award 2014 today in Berlin to outstanding inventors or teams, honouring their contribution to social, economic and technological progress. The award ceremony, held at the former Kaiserliches Telegrafenamt (Imperial Telegraph Office) in Germany's capital, was attended by some 500 guests from the fields of business, science, culture and politics, including German Federal Minister of Justice and Consumer Protection Heiko Maas. 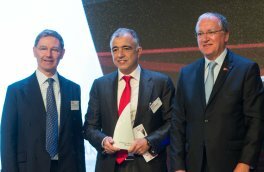 "Innovation is absolutely essential for Europe to generate growth and prosperity and secure its position among the leading industrial regions," said EPO President Benoît Battistelli at the award ceremony. "All of the inventors we are honouring here today have introduced game-changing technological innovations in their respective fields. Their achievements improve people's everyday lives, and represent substantial contributions to tackling major global challenges such as climate change, access to clean drinking water and improving health. 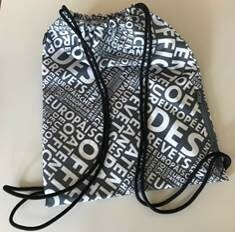 Their ingenuity and creativity are indicative of Europe's position as a leading technology region. And patents play a major role in protecting this status on a daily basis." With over 1 100 applications for patents and utility models, Artur Fischer is one of the most prolific inventors of all time. His invention and namesake, the expansion plug (or "Fischer wall plug"), revolutionised the construction industry in 1958 and has been used billions of times around the world ever since. Other innovations which have earned him worldwide recognition include the first synchronised photo flash for cameras and his "fischertechnik" toy building sets. The team was distinguished for its efforts in developing the first new effective tuberculosis (TB) drug in 40 years. Thanks to the research team led by Andries and Guillemont, the disease - including multi-drug resistant forms - can now be treated successfully. The innovative drug quickly cuts off the energy supply in TB bacteria, significantly reducing treatment times and enabling a full recovery. 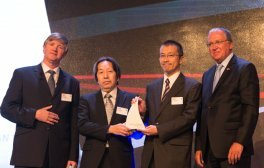 The Danish team received the Award for their invention of a water-purifying membrane coated with aquaporins, which purifies water without consuming large amounts of energy. The innovation of this Danish team of chemists relies on the natural filtering function of so-called aquaporins. Unlike conventional methods, it does not require an elaborate filtration system based on energy- and cost-intensive hydrostatic pressure. Christofer Toumazou won with his invention of a quick DNA test which can decipher the genetic makeup of individuals within minutes, without the need for lab work - a milestone along the path to innovative medical healthcare with a preventive focus. The innovation is based on a microchip that detects deviations in an individual human genome. The chip can be inserted into a USB stick, providing results that are viewable directly on a computer. 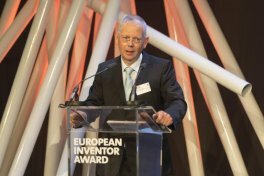 Charles W. Hull received his European Inventor Award for the invention of 3D printing - a technology that is currently in use in numerous fields and that has triggered a veritable revolution in manufacturing. Although a multitude of different procedures for 3D printing now exist, they all build on Hull's original invention. It is hard to imagine day-to-day life without the QR (Quick Response) code they invented. Among other things, it is used for managing inventory in factories, administering patient files, tracking biological samples and as a marketing tool. The QR code links the physical world with the virtual realm by means of a smartphone or tablet and the relevant app. The choice of the public was clear, as nearly 30% of the more than 20 000 votes cast went to the Japanese team. The number of votes was more than double the number received in 2013. Accepting the award in the category "Research", Christofer Toumazou said that the invention was for "future medical doctors, my son Markus, and my wife Melanie". He finished with a quote: "The future has already arrived. It's just not evenly distributed yet." Peter Holme Jensen, winner in the SME category, said their invention "create a sustainable future for water". He thanked his wife for supporting him when he decided to "quit his day job" and pursue his idea. Claus Hélix-Nielsen encouraged young people to work on innovation. "There's plenty of work to do.... Go for it. The sky's the limit." 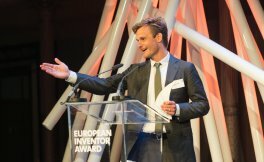 Industry winner Koen Andries said he was "proud to accept the award on behalf of eight colleagues", adding that it was "a tribute to all companies and researchers working to fight disease in the third world". Charles W. Hull, winner in the non-European category, thanked the "hundreds and hundreds of scientists and engineers who helped make 3D printing what it is today". Popular Prize winner Masahiro Hara also thanked his "team members and company" and the "many people" involved in spreading the QR code all over the world. 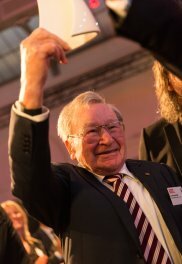 Receiving a standing ovation, Artur Fischer, winner of the lifetime achievement category, said the award was "one of the greatest presents" he had received "in a long life". He encouraged parents to let their children play, saying "we have to keep the child within us if we want to be rich in invention."